The day before the Feast of St. Nicholas, which is on Dec. 6th, a strange creature is honored in the Germanic and Central/Eastern European lands. 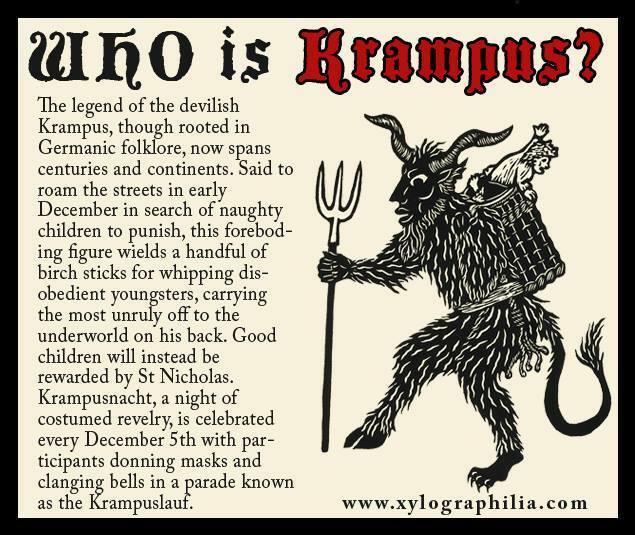 Though he goes by more than one name, he is best known as Krampus. He’s a strange looking fellow: covered with hair, bound with chains and bells, a basket on his back and a switch in his hand. He sometimes has one human foot and one hoof, and a long red tongue. His face is frightening; he’s like a cross between a wild animal and a demon. He’s also St. Nicholas’s helpmate and friend. Basically, the idea is that someone dressed like St. Nick and someone dressed as Krampus will go around and visit families. Krampus will switch bad kids, and leave them coal instead of candy, and threaten to put them in his basket and carry them away if they’re really bad. It’s a stick and carrot kind of thing. 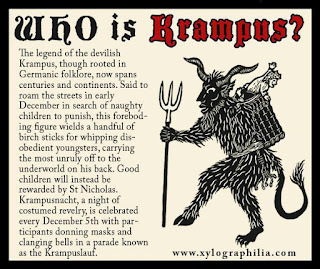 I’m not sure I agree with some of the lore about Krampus—the link below seems to connect him to the Norse goddess Hel, but I’m not sure about that. However, his female counterpart, Frau Perchta, is definitely related to the Norse legends. She’s sometime conflated with Frau Holle, who is also reckoned to be somewhat like Hel. She looks like an old witch, and she switches you with her broom. Like Krampus she has horns, and some of his other accoutrements. According to the legends, Perchta is likely to mess with you on Twelfth Night, and she goes for the women. If you haven’t finished your housework by then, she disembowels you. Yikes! Rev. Dee makes a Krampus oil, and it is perfectly appropriate to wear this oil as a unisex fragrance all through the holiday season, or use it in an oil warmer (we sell those too) to perfume the room for your holiday parties or rituals. Krampus oil smells like cinnamon, patchouli, carnation, rose, vanilla, mugwort…and maybe just a bit of brimstone. If you feel moved to leave out a snack for him as well as for St. Nick, well, he likes traditional European sweets like stollen, pfeffernusse, fruitcake, marzipan, and similar seasonal desserts. Toast him with Gluhwein, Glogg, spiked eggnog or cinnamon schnapps. 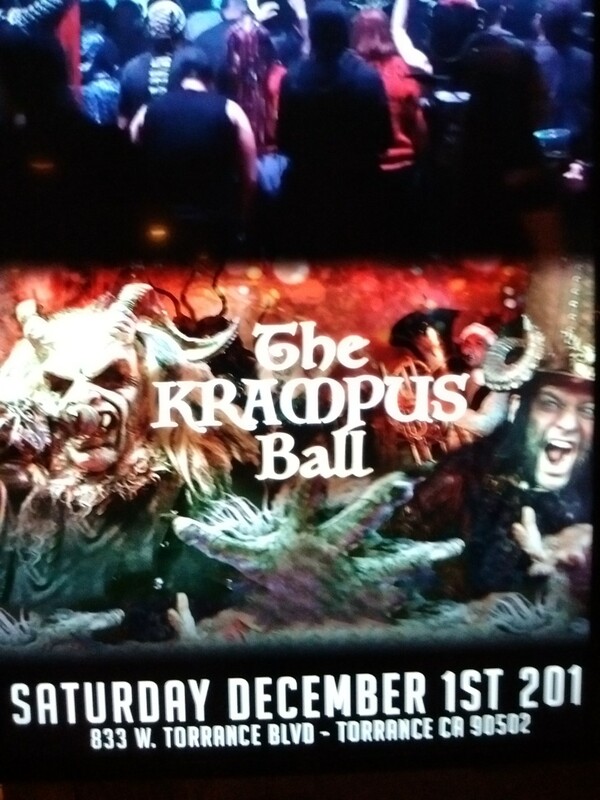 In the places where these legends are popular, Perchta and Krampus often appear together, often in big groups that parade through town in a Karmpuslauf, or a “Krampus run.” Many large cities in the U.S. now have Krampus runs, including Los Angeles. 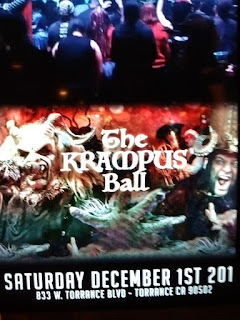 Having just attended the Los Angeles Krampus Ball at Alpine Village and being switched by no less than FOUR Krampuses, I can tell you that it’s all worthwhile. I have been punished for my sins. Now the party may begin!